The ProTraining booklets and training courses were designed for the professional technician. 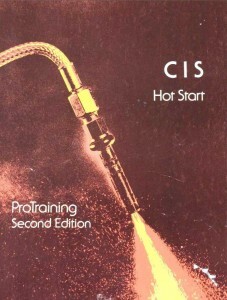 This ProTraining booklet will help you understand what causes a hot starting problem. More importantly, it will aid you in diagnosing and repairing the problem. Our goal is to help you fix the car right… the first time. How CIS Works – this section explains how the CIS system works and explains the causes of hot starting problems. How to Diagnose Hot Starting Problems — This section explains the two part diagnosis procedure. Part one of the diagnosis procedure includes basic checks and basic adjustments and is followed by a Hot Start Test. Part 2 of the diagnosis procedure includes more in-depth checks and a second Hot Start Test for those cars which have a more uncommon problem. How to Repair Hot Starting Problems — this section contains repair instructions for problems which you found in the diagnosis section. Special Modifications — the last section explains special modifications which should be performed only in those extreme cases when a car fails the Hot Start Test, Part 2. Should you be asked to repair a hot starting problem, please follow the Hot Start Troubleshooting Sequence which begins on page 11. Then follow the sequence page-by-page until you have diagnosed and repaired the problem.